Optimally utilize existing and new media networks as powerful means of reaching of the Community at large. CEE has several programmes on experiencing nature, guided by a strong belief in the value of learning through direct exposure, enhancing appreciation of the beauty and interrelatedness of nature, and promoting learning by methods that are inherently fun. It sharpens observation, brings fresh insights to the familiar and the obvious, compelling revision of popular beliefs and dispelling common misconceptions. Many individuals, having undergone such exposure, are inspired to embark on their own voyages of discovery about the environment. Providing a public service of rescuing, and releasing into appropriate habitats, reptiles that have strayed into areas of human habitation, protecting them from harm. 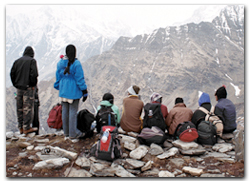 Sundarvan offers a number of educational programmes based on outdoor activities that include camping and trekking. Sundarvan has permanent camping facilities at Bakore and Beyt Dwaraka in Gujarat. Sundarvan also undertakes collaborative public educational programmes with other conservation organizations such as WWF India and BNHS. Sundarvan has been recognized as a mini zoo by the Central Zoo Authority, and is a popular public education facility in Ahmedabad. Nandanavanam is a nature education project initiated by CEE and supported by Urban Forestry Division of Municipal Corporation of Hyderabad (MCH) and State Department of Education. The project aims to orient school children to plant life in urban areas through practical exposure. Nanadanavanam encourages students' action for conservation of green areas in the city. Many of CEE's other programmes, especially those for children and youth, incorporate a strong outdoor component in the form of trekking, camping and visits to natural heritage sites. These play a vital role in bringing the experience of nature to bear on the promotion of environmental awareness, raising concern about conservation, sustainable development, motivation for environmental education, and often to action.